In this tutorial, we will learn how to debug an Express-based API with the help of Visual Studio Code. Express is a “minimalist web framework for Node.js”. It allows us to link functions directly to API endpoints, which is a quick and simple way to build an API. We will also use cURL to send requests to our API. We will create a simple API with the Express framework and then try to debug it with the help of VSCodes debugging features instead of the console. First, we create a new Node.js project and install our dependencies. Next, we create an index.js file that will act as our main server script. We use the users array as our in-memory data-store. It gets initialized with an admin user. Next, we create our Express server and use the JSON middleware of the bodyParser package; it allows us to access the values of a JSON string stored in the body of a POST HTTP request. Then, we create three API-endpoints. Two GET endpoints so we can request a list of all users and one specific user by its ID and one POST endpoint to create a new user. Let’s start the API with the following command! Now that our API is up and running we can try to query it with cURL. For this, we need to open a new terminal window and execute the following commands. Oh no! We have a typo in the JSON, users instead of user. Since we didn’t handle this in our POST /users endpoint, Express just responded with an HTML formatted error. This is a simple example of a problem that could be fixed without much hassle, but let’s use it to start VSCodes debugger so we can investigate what went wrong directly at runtime. 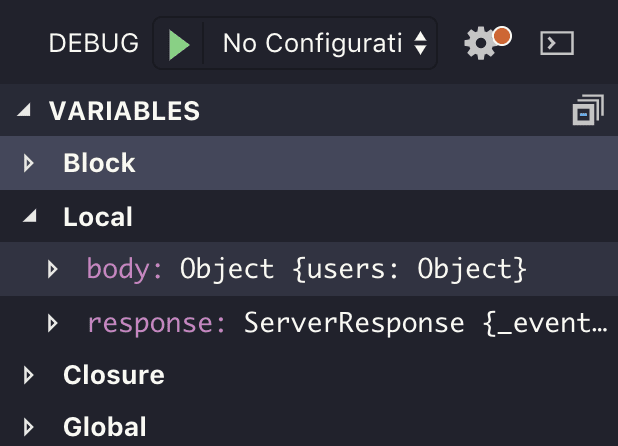 Debugging Node.js APIs with VSCode is very easy. We check which endpoint we want to debug and set a breakpoint inside the function that endpoint triggers. This is done with a left-click left to the line number. Let’s to it on line 15, which should be the first line of our POST /users endpoint function. Then we start the debugger by clicking on Debug->Start Debugging at the top menu or by pressing F5. VSCode will start our application and the debugger for us. It will also link the two together via Node.js’ debugging protocol. Then we re-send the request that led to an error with cURL and try to find out what happens. This request will run the function linked to POST /users and halt at the break-point in its first line. If we look at the side-bar on the left of our code, we can see a VARIABLES category with various sub-categories like Block and Local. Let’s open Local and see what’s inside. As we can see, we have two local variables, body which is of type Object and response which is of type ServerResponse. Let’s step to the next line with F10 to see what happens. All seems to work as expected. Let’s step to the next line again. Somehow we ended up in a whole different place of the code-base? It seems like we created an error by setting the id of our user object, how did this happen? Let’s open our index.js again, move the break-point to line 16 and let the debugger run to the end of the event loop by pressing F5. Then re-send the request with cURL to see what happened before we tried to set user.id. 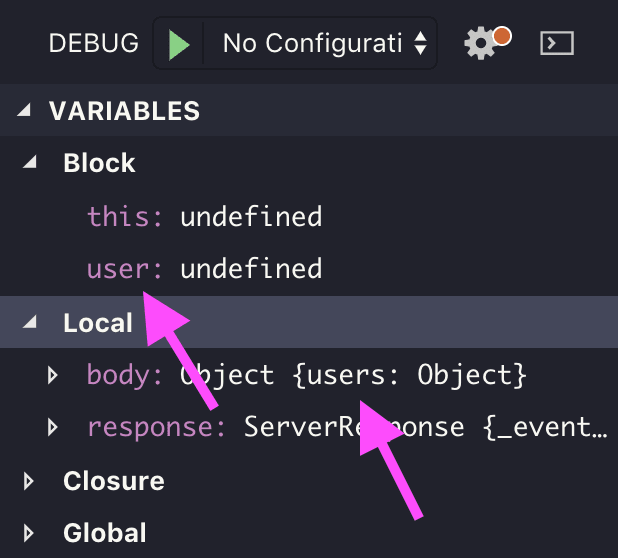 When we look into the side-bar in the VARIABLES/Block category, we can see that our user object is in fact undefined! If we open the VARIABLES/Local category, we can also see why. Our body has a users attribute, but we try to destructure a user variable from it in line 15, which leads to an error when we try to write to user.id in line 16. Now that we now our problem, let’s stop the debugger and fix it. Finally, we get a useful JSON formatted error message. Debugging Node.js based APIs with the help of VSCodes integrated debugger is a straight-forward task. We just need to set a break-point, no additional code involved.